It's finally here! "Love Saves the Day", the second cat book by New York Times bestseller Gwen Cooper and author of the memoir "Homer's Odyssey: A Fearless Feline Tale, or How I Learned About Love and Life with a Blind Wonder Cat". Christine reviewed the latter book years ago which inspired her to champion for black and disabled cats. Hence our black cat logo and the Black Cat gala. Today we received an email from Gwen Cooper asking us to share the news of her latest book release with all of you, to keep educating and uplifting the world with cat love! See the video below for a preview. News of this book release is music to our ears. 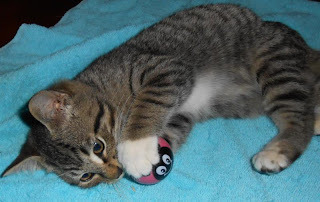 As a nonprofit for cats, we often receive calls from individuals who are trying to find a home for a pet cat that once belonged to a deceased parent. Often the son or daughter or relative state that they can not keep the cat. "We just can't" or "It would not work in our household because of the dogs..." Excuses pile on. We encourage the person to give it a chance and ease their mind by offering some tips and guidance for bringing in a new cat. We are so excited about this book and highly recommend it to any person who has taken in a cat from a parent or friend who passed away. "Love Saves the Day" is a story of hope, healing, and how the love of an animal can make all of us better humans. There's a wealth of scientific evidence that shows that cats and dogs and other pets make us better humans. It’s the story of a mother and daughter divided by the turmoil of bohemian New York, and the opinionated, irrepressible feline who will become the bridge between them. It’s a novel for anyone who’s ever lost a loved one, wondered what their cat was really thinking, or fallen asleep with a purring feline nestled in their arms. Prudence, a cat like no other, is sure to steal your heart. Order your copy now of Love Saves the Day from Amazon and Riverfront Cats receives a small percentage*. Let's keep educating the world about the unique essence and personality of cats. *Riverfront Cats receives a small percentage of every Amazon purchase from this website an affiliate of Amazon. Neither Amazon nor Gwen Cooper or Random House Publishing directly endorse the activities of Riverfront Cats/Pawsitively Humane,Inc. While they're not the next Batman & Robin fighting crime in Gotham Miami, or Penn & Teller- dismembering and putting together a lovely human, blonde volunteer in a magic show... Henry & Hobart are famous--or will be famous as the famous snugglers! Not smugglers silly. It's snugglers with an "N". Nuzzle, nuzzle, wet nose, droopy eyes...they have their act together and will melt your heart! These two brothers were rescued at 3 months of age in October 2012. Both kittens love to be held, purr like little motors, and give kisses. Super sweet. Right on time for Valentine's! Light blue blankie included! 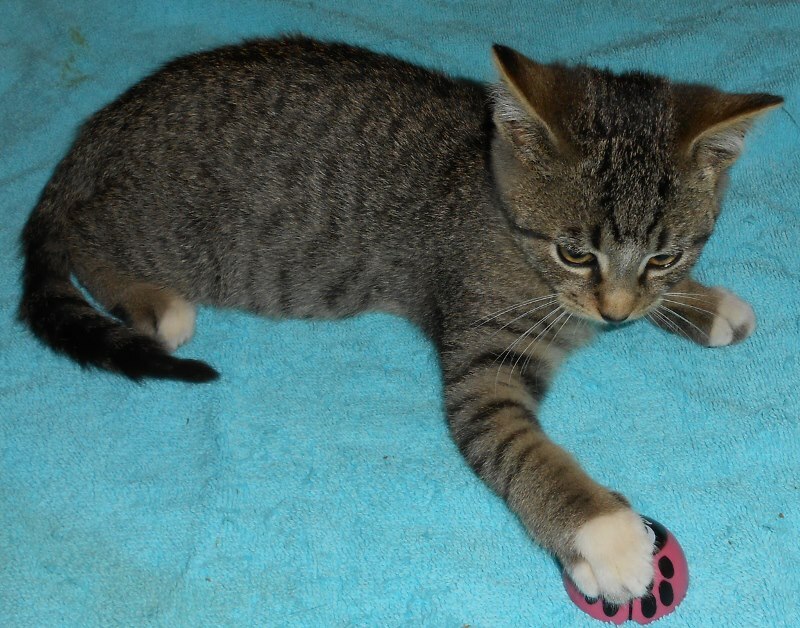 To meet Henry & Hobart, contact foster mother Christina at cdm1580@bellsouth.net or. 305-338-4534 (Miami, FL). 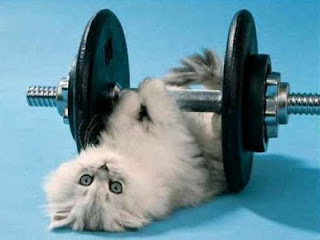 Our Resolution is Not to Lose Weight! The ball has dropped, the fireworks are bursting in the air, the clinking of glasses, the hugging and kissing and well wishes encircle the globe like a giant wave. It lasts only minutes. Then suddenly we return to routines, the daily grind and the dreaded.....Resolutions! What's our resolution? Well, it's definitely not to lose weight. That would be too easy! So we try it one more day, one more week, one more year. It's all worth it. A dying kitten is nursed to health, an abandoned cat is rescued and placed in a new home. It may not be thousands, but we made a difference! A weekly routine consists of walking outside, feeding and checking on the Riverfront Cats and other community cats, trapping new cats, rescuing kittens, shuttling back and forth to vet clinics, attending all-day adoption events, answering daily phone calls, visiting potential adopters, writing, blogging and leveraging social media...below are some lows and highs that stand out in 2012. And along the way we try to have some fun. Christine learned about the Loews Hotel cat crisis in Orlando December of last year and announced it January of this year. Christine was amazed at the immediate response and instant unification and support from cat bloggers and cat lovers around the country. These were complete strangers who came together for a common good. While cat advocates may have lost the battle to keep the cats at their "home", we kept moving forward and never gave up. We turned to Plan B. Heroes like CARE Feline TNR (an organization in Orlando) painstakingly rescued the cats from the kill-shelter and relocated them to new "adoptive" backyard homes. Relocation is a risky process. Some run away. Thankfully most of the Loews Hotel cats have accepted their new homes.You can follow their stories at www.facebook.com/SaveLoewsCats. Several new cats were discovered here at the Riverfront Cat site. Two were clearly dumped (it is illegal to relocate any cat--pets or strays), others were strays. The two strays were very ill and one losing his eyesight. Both feral. Both had to be put to sleep. Others like Charlie, while initially skiddish, warmed up to us. Fanny, another dumpee, we discovered was spayed as evidenced by her ear tip. She also appears tame. But we are still waiting for a volunteer to take her inside to socialize her. Her chocolate milk mustache is so endearing. Fanny is extremely clean and tame for an outdoor cat. 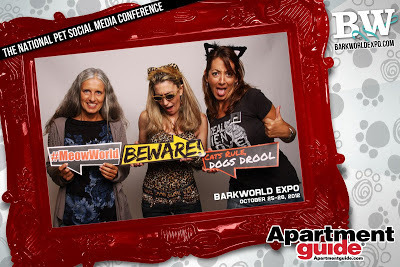 Attending conferences like Blog Paws introduced new ideas and opportunities to raise awareness for homeless cats and pets.Christine was thrilled to meet some famous Cat Ladies and start writing for Pet360.com, a national pet website aimed to help pet parents. Charlie was fostered and adopted by Nina, one of our volunteer caretakers. A big HIGH. Then Nina and Charlie moved to the Middle East. This was a huge loss as dedicated volunteers like Nina are rare. 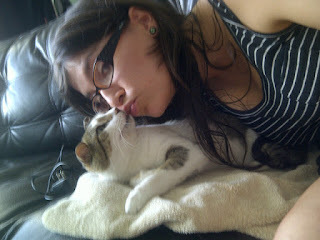 But the silver lining is that Nina and Felipe are model examples of pet parenting and planning. Charlie was now their pet, a lifetime commitment and they went to great lengths to finalize travel arrangements for his safe transport to the United Arab Emirates. Nina and Felipe spent close to $2,000 for customs, airfare and cattery fees. There was no question. It had to be done. Now we enjoy following the adventures of Charlie and his big move to Abu Dhabi. This is a peak high and a story we will continue to spotlight. Christine receives a call about a kitten with a bad leg residing up the Miami River. Little Sophie dragged a leg out of hip socket. She bravely underwent a first surgery weighing one pound in an attempt to save the leg and a second surgery to amputate her hind leg, weighing only two pounds. The vet bill is astronomical and we are still collecting donations to pay off the credit card bill. Thankfully little Sophie is recuperating nicely and has adjusted to her missing leg. Her zooming hops across the room is a match for Speedy Gonzalez and her constant purring is a sign that all is well in the world for this once stray kitten. Another small victory. Christine also attended BarkWorld, another pet conference in Atlanta, GA. Here she added to her knowledge of writing and blogging and had a chance to wear cat ears all day long! Even the hotel staff wanted to wear ears. It was a great opportunity to reconnect with fellow bloggers and have a rare moment of fun! (Note: Christine paid for the trip with her personal funds). Figaro & Luciano were adopted! Kittens grow up fast and it's very hard to find homes for them beyond five or six months. 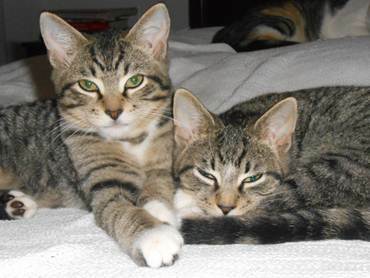 Both brothers were adopted together by a loving family in Hialeah. At Riverfront Cats our specialty and passions are feral cats and black cats--the most misunderstood of the cat family. Adult black cats are the most difficult to find homes for. Therefore we are thrilled to report that several adult black cats were adopted. Tiffany, Evie, Peter Peter, and Sweetie & Berrie. and it's not losing weight! At Riverfront Cats, we choose hope! Writer- an eloquent, strong writer to write posts for our big brother blog site www.pawsitivelyhumane.org. Education is the key to reversing the trend of homeless pets of both dogs and cats. Both educational and humorous content is our goal for balance. A weekly post is all we need. Graphic Designer--If you take an average photograph and tweak the coloring, the shades, add some clip art, a catchy phrase or title, one can attract more readers, more followers to learn about cats, take an interest in cats, adopt or foster cats, and spread the word about cats. This is our biggest need of all. Excellent Photographer--Cats are mystical, exotic creatures. Their expressions and body language speak volumes. A photographer will help capture the essence of cats and carry it over into our communications, marketing and education efforts and to teach "cat". Foster parents--this job is more demanding but also very rewarding. Whether you like dogs or cats, or both, foster parents are needed to save healthy pets from being dropped off at county shelter and euthanized. Moral support--this is easy. In the world of rescue and education, the obstacles are exceedingly high, frustrations mounting that it's easy to feel defeated. The biggest boost and what keeps us going daily, are your thoughtful comments. Please continue to leave comments on this blog (you can register to the right), on our Facebook page and Twitter. Your encouraging comments uplift our deflated spirits in difficult times. We could not do this without your moral support! Here's a to a brighter 2013! At Riverfront Cats we specialize in feral cats. We find them (or they find us), feed them, get them spayed/neutered/vaccinated, shower them with attention and affection, and when possible provide cat houses. 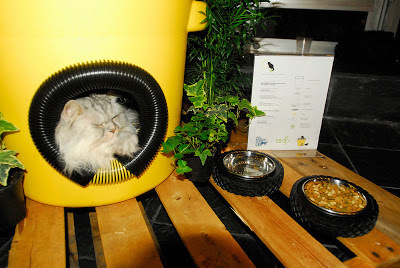 One of our goals is to build more cat feeding stations for the rainy season. Why not? Feral cats are cats too! They are the neighborhood pets and deserve to live humanely. Sadly our two new stations were taken this past Christmas. But this story gives us hope for something bigger and better this New Year! It's a feral cat initiative. How brilliant! 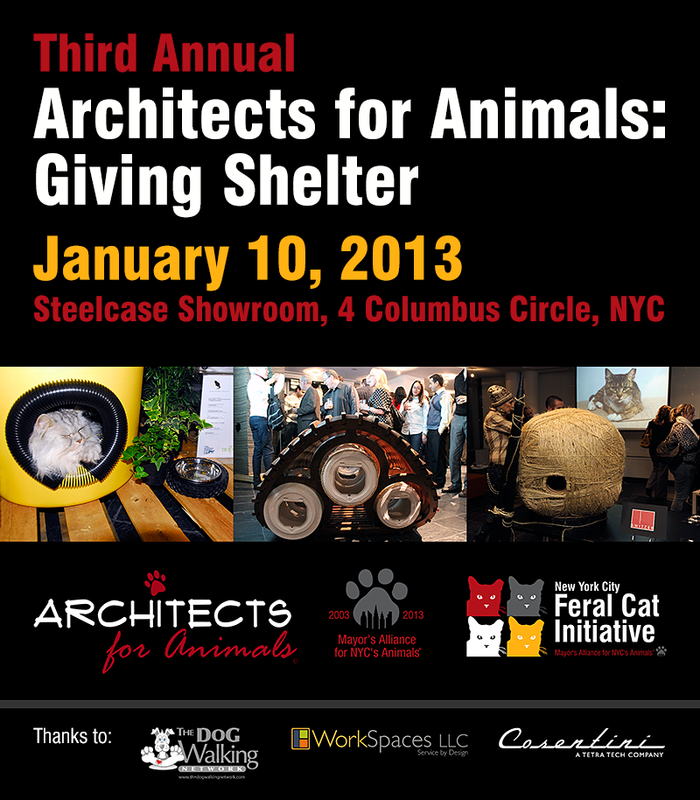 You too can help cats in this innovative event. Read on! 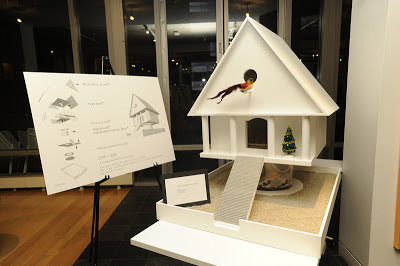 For the past three years, some of New York’s most prestigious architectural designers, through an inventive project called Architects for Animals, have been helping these cats by creating imaginative winter shelters to provide feral cats with a refuge from the bitter cold. 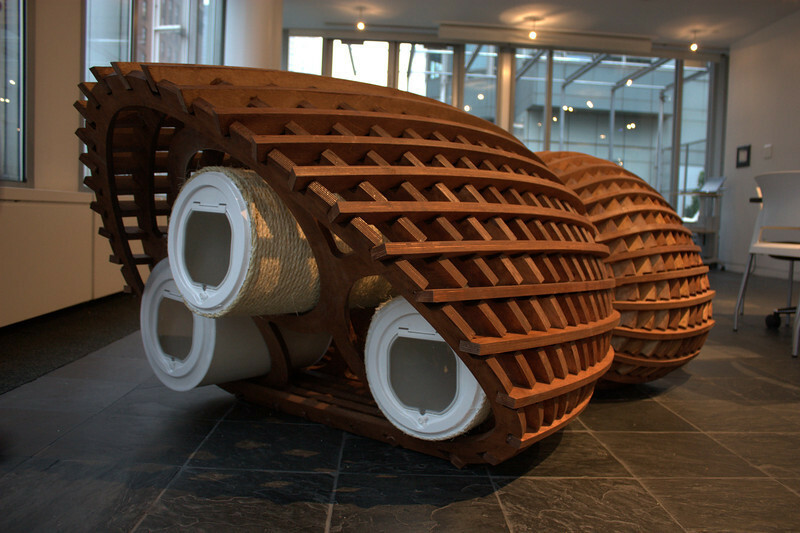 A new collection of unique, inspired Architects for Animals winter shelters will be displayed for public viewing before they are placed in locations throughout the city to provide comfort for the cats. Just look at the range of creativity in the photos below (taken at the December 2010 and 2011 event). Doesn't this "Cat SH3LTER" look like an indestructible bunker? Winters can be brutal up north. This is one of our favorites. 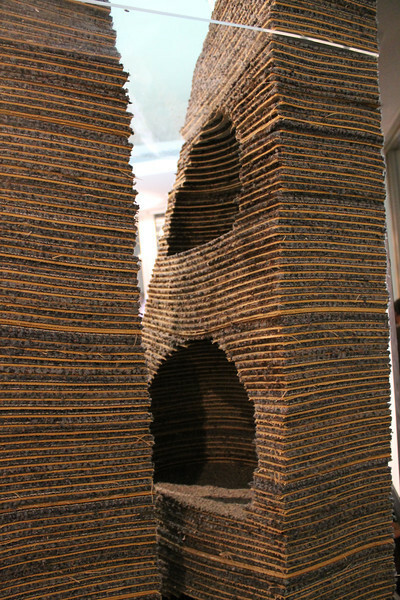 I wonder if the architect is simulating a tree with cubby hole? Cats love to perch. Genius! This one is the white house with moat, bridge, columns, birds and a Christmas tree! We'll take two sunshine yellow cat houses please. Do you see those tire wheel feeding bowls? Love them! We feed our cats on empty lots. Those would tie in nicely with loose car parts and other empty lot accessories. No home is complete without yarnball. And the big daddy of them all--rocket boosters. At least that's what it remind me of. Now I can envision those around my hometown near the Kennedy Space Center in Cape Canaveral, Florida. So which do you like the best? This year’s participating architectural firms include industry giants H3 Hardy Collaborative Architecture; Francis Cauffman Architects; M Moser Associates; Callison Barteluce; Stonehill & Taylor Architects, with a team of students from City College; Zimmerman Workshop; Kathryn Walton of The American Street Cat (TASC); and Pilot Projects Design Collective, to name a few. 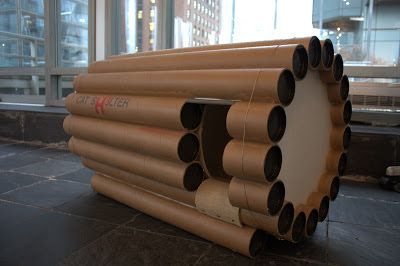 At the end of the evening, the shelters will be donated to community cat caretakers around the city. 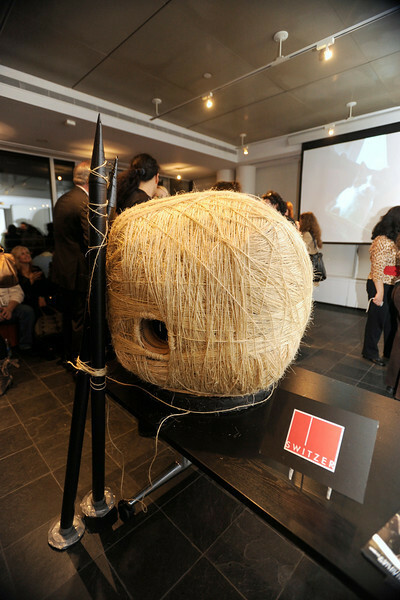 So head over to the Steelcase Showroom at 4 Columbus Circle on Thursday, January 10 to view the newest collection. 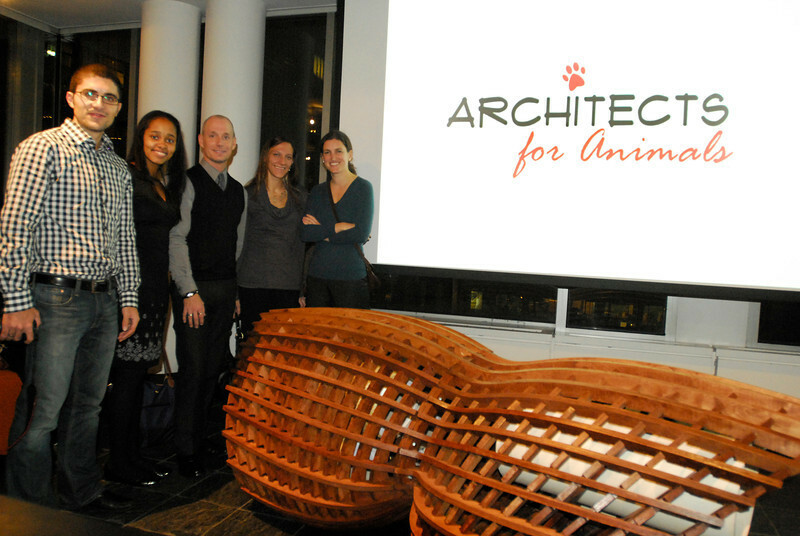 Meet the architects, feral cat caretakers, and also the one and only Tamar from I Have Cat! If you can not attend, you can still donate to this great cause by clicking on this link. Admission is a $20 donation ($10 for Certified TNR Caretakers) and includes the exhibit, hors d’oeuvres, and drinks. You may RSVP in advance online. Be sure to drink a Cat-tini for us!